Notes from the Slushpile: Writer's Software: Is it any good? Writer's Software: Is it any good? A writer can scribe on anything - if you have an idea and you're anything like me, you've probably scrawled stuff down on napkins, the back of your hand and old bus tickets. None of these are very practical though - and you'd probably struggle to write a novel on them. I used to write mainly in Word, with a notebook by my side to make notes as I went. 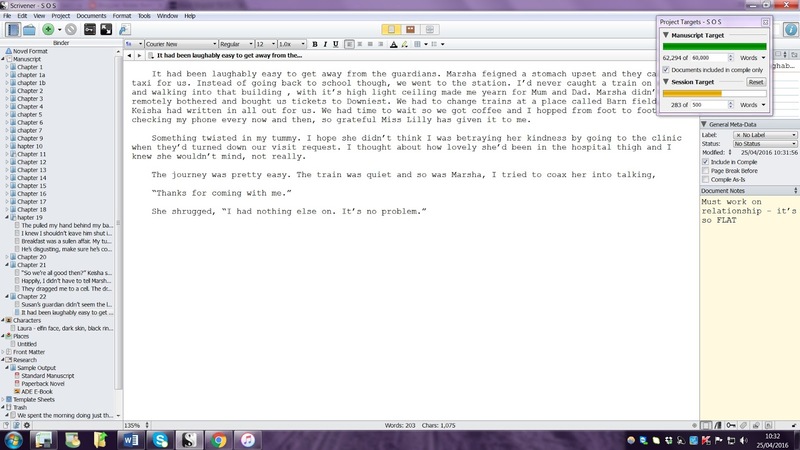 Then I discovered writer's software. For the disorganised amongst us ( me) it's an absolute godsend. Scrivener is my software of choice but I've drafted in a little help from Jo Wyton, to speak up for Word, and Philippa Francis for yWriter. If you're a fan of something else, please let us know the pros and cons, and where you can get hold of it, in the comments! Platforms it works on: Windows only. Available support: Not sure how good the support is but there isn't much to go wrong - if you can answer this please add to the hive mind in the comments! I use it from the beginning of a piece of work, and also during the editing process. It enables me to structure my work into scenes and chapters easily – with scope to move them around. The more I fill in the sections such as Goals, Locations and Scene Summaries, the more I understand my own story. The advantages are the price, the ease of manipulating scenes and chapters, and the different kinds of practical focus available; i.e. timescale or ratings which you can decide on yourself. All data is easy to read. The program can also read text aloud – in rather a robotic tone, I admit. The disadvantages are that it’s only suitable for PCs, it is definitely not pretty and the completed files are a little tricky to handle. When you export the finished story, you have to re-format it, and as yet, I don’t know how to move a completed work into a new project. You have to start each project from nothing as far as I can see (I am no PC expert!). Still, I really find it practical - and would be happy to help with queries. You can download a free trial for 30 days and it only counts the days you actually use it. To buy the full version is $40, forever. The 30 day trial period is about right. It took me a while to love this piece of software. I resented it in the way I used to resent tidying my room. Slowly, however, I learned to appreciate it. So much so that I'm a complete convert. Platforms it works on: Mac and Windows - there is a version in the pipeline for iPad but it's been a long time coming and no real sign yet. Available support: Excellent - it might take a day but they respond to email and will always help - there's also some brilliant forums where you can quite often find answers to your questions. I now write, and edit, my whole novels in it. It's very easy to divide each chapter into scenes, add notes to the side, even pictures and character notes. I'm lazy with it really - I coudl and should use it better - by giving my scenes titles, for example, I could more easily manage a structural edit - even so, it's clear to see and overview. Once I need to send it to my agent and/or editor, I compile the document and move it to word. I do all future edits in Word but this is mostly because they don't use Scrivener and it's easier to work with their tracked changes where they are. I find it intuitive to use but if you don't, the tutorials are easy to follow. Heaps of useful content and ways to use it. The word count / target word count box is invaluable. It's great for the more disorganised amongst us (me) and it looks nice too! There is a lot of potentially useful content that I don't access because I can't be bothered to work it out. Not really a con of Scrivener. It depends, but most people who own a computer already have the Office package I guess. If you work for a large company, it's worth checking whether they have an arrangement with Microsoft for a much cheaper version. Available support: Like with Scrivener, although probably to an even greater extent, there are forums galore for software support. Fairly simply. I maintain a planning document and a separate file for each chapter. That way I'm not constantly drawn back to re-reading and revising previous chapters. I already know how to use it, so there's no time spent learning the how. It also makes it unbelievably easy to transfer files between computers to work on. For example, I have a desktop Mac as well as a notebook, and having things in Word just makes it so easy. I can also transfer to Windows computers for printing etc without worrying about having to reformat. 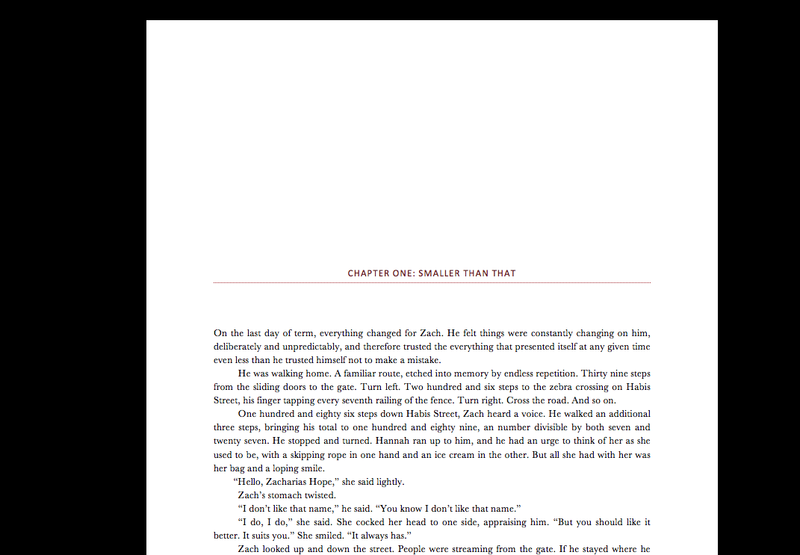 I also love the 'full screen' mode, which is similar to Scrivener in that it block all else from your screen, has changeable backgrounds, etc. Some might find it overly simple for building a manuscript in. But for me, the simplicity is its main draw. So there you go - I have to say I would REALLY miss Scrivener if I didnt' have it. I broke the target word count last week and it drove me crazy not having it - it was like all the words I was writing didn't even count. Thank goodness for the support forums, once I'd fixed it I had a lovely ( 2000+ word) surprise. Conclusion? If you've got an untidy brain , writer's software that can take you to a whole new level of organisation is really worth it. Do add your own experiences in the comments - it all adds to the hive mind! Kathryn Evans is a stalwart SCBWI member. She tweets @mrsbung and hangs about on instagram kathrynevansauthor. She's got a book out too,: More of Me was published by Usborne in February 2016. Thanks for the post guys. I was a devoted Word user until I changed from PC to Mac ...Word for Mac is just so inferior to the PC version that I got tired of my own complaining. I had a go at Scrivener and found the guides very confusing However once I ignored the guides and googled my queries instead, it began to work beautifully for me. There are generous souls posting simple to understand how-to's on Scrivener-focused blogs everywhere. I still use Word but only to export final draughts of my manuscript. 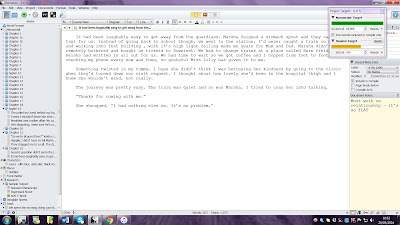 I am such a untidy writer with no staying power. I have notes and notebooks stashed and left lying about for me to find and say, 'oh, that was a good idea.' I need to be more organised. Maybe,I'll give Scrivener a go. Many thanks for posting! Addy I really think you should - but give it time! I agree with Candy - I got really bogged down in the tutorials. I got on far better when I just had a go and googled when I got stuck! I find too much organization in my writing alarming! I use Word like Jo, but have never done separate documents for chapters etc. All I have is one lovely big document (well, that is the idea) which is the whole book, and generally - at some point - a chapter summary document, with a blank column next to each chapter when I can scribble in stuff that needs doing or changing later. There might be a few more documents now and then with bits of other stuff - like a cut bits documents, in case I change my mind - but that's it. It used to be that word tended to crash a lot with big documents, but I haven't had that problem with it in years. 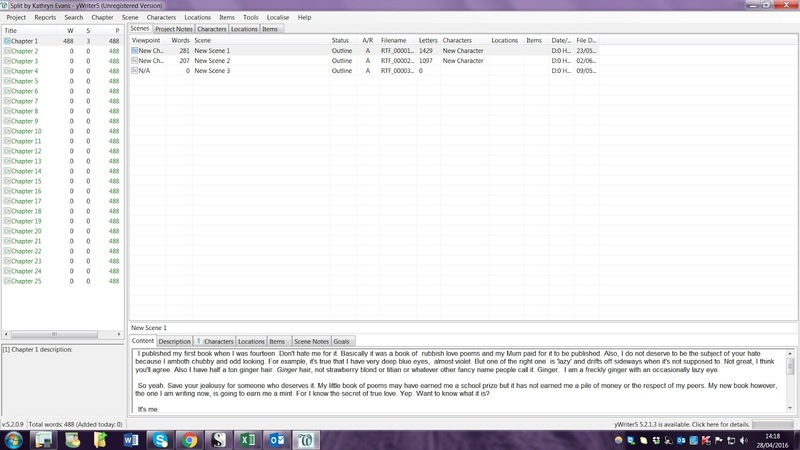 I did buy a copy of Scrivener, took a look at it, and thought - Whoah! that is way too much organising. I like messy madness. p.s. I do have a notebook for each book as well for scribbling in, and that's where my messy madness really takes over! I'm with Teri. One long doc in word. But I also have a mega spreadsheet. It includes a chapter summary. 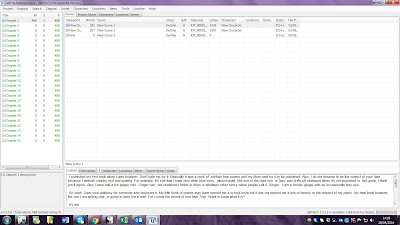 I tried Scrivener but found it difficult to manage using dropbox or google drive to access it on different computers. I've not heard of ywriter.